GOVERNORS RACE – The big story is obviously that Larry Hogan won a second term as Governor. I like the guy and wish him well, but no offense, I just couldn’t support him when he’s been vetoing things like paid sick days, renewable energy, ex-felon voting rights and marijuana decriminalization. I will give him credit on criminal justice reform, because I think he’s better than some Democrats on that issue, and his administration actively worked with our side to craft the Justice Reinvestment Act (note: Maryland now leads America in its prison population decline). DOWNBALLOT RACES – Maryland preserved the status quo in its Congressional Delegation yesterday (2 Democratic US Senators, 7 Democratic US House Members, and 1 GOP US House Member). In contrast, the downballot races witnessed some big shifts, and Hogan’s win did not come with coattails in the state’s numerous competitive County Executive races. 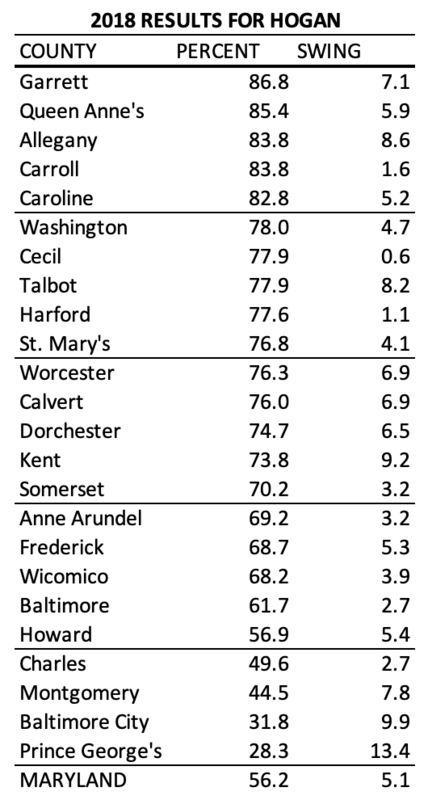 Democrats already had the top offices in Baltimore City, Baltimore County, Prince George’s, Montgomery, and Frederick. Last night, we held onto all of those offices, despite the purple tone of Baltimore and Frederick counties. More importantly, Democrats defeated the incumbent County Executives in Howard and Anne Arundel. That means we swept the elections in all of the state’s major population centers, and last year we replaced incumbent Republican Mayors in Annapolis and Frederick with Democrats. HOGAN’S FUTURE – But I’ve had so many questions about how a 2nd Term Larry Hogan would choose to govern. Believe it or not, I’m actually a fan of the idea of Hogan trying to go national in the Republican Party, because he’s far less crazy than the current leaders in the national GOP. The problem is, that Larry Hogan is now term-limited, so he may not have to face Maryland voters again. Additionally, the current national GOP base incentivizes views that would not be considered moderate to the Democratic electorate in Maryland. Consider, for example, John McCain’s Confederate flag pandering in the South Carolina GOP Presidential Primary (he later apologized). Does an ambitious Hogan need to similarly worry about the GOP base and rightwing donors if he wants a future in the national GOP, or will he govern like the “bipartisan” candidate that appeared in Maryland? I suppose we’ll soon find out, and I assume this relates to what Hogan plans to do next. The calculus might be very different if he decides to run for US Senate vs President. BUT THOSE VETOS – Either way, Hogan’s pesky vetos have always weighed heavy on me. Even knowing he had to face Maryland voters again, First Term Larry Hogan still vetoed popular policies like increasing renewable energy and guaranteeing paid sick days. It was only because of the veto-proof Democratic majorities in the House & Senate that Hogan’s wishes never became policy in Maryland. Imagine the opposition he would’ve faced this election cycle if we didn’t override his vetos, and policies like renewable energy and sick days then failed because of him. Notably, Hogan was very publicly trying to defeat enough Democratic Senators yesterday to overrule the legislature on the issues I mentioned above (Google Larry Hogan “Drive for Five”). He was so upset about the Democratic veto overrides that he even opposed incumbent GOP Senator Steve Waugh in this year’s Republican Primary, because Waugh sometimes voted to override Hogan’s vetos. Waugh was then defeated in the primary by a Hogan-backed candidate, who we can now assume will tow the GOP party line on veto overrides (is that what moderate bipartisanship looks like?). Clearly, Hogan cared about the Democratic policies he vetoed (I care too). But it remains troubling to me that these vetos were not a major focus of debate in yesterday’s election. It is not so mysterious though, when you consider how much of our attention has been drawn toward the Trump administration, and how Trump’s unique brand of crazy makes our governor look moderate, even when vetoing modest renewable energy increases. “Moderate” is obviously and inherently a relative concept. 1) IMMIGRATION – In the last four year term, the State House passed a few bills intended to provide protections to immigrants in Maryland. These bills generally died in the State Senate, perhaps with some concern about the seats Democrats had to defend in conservative territory this year. But House Democrats gained seats, even while passing policies like the “Trust Act,” which were labeled “sanctuary state” bills by the opposition. Hopefully this means immigration gets a fresh look in 2019. 2) MARIJUANA – Likewise marijuana legalization was at a potential fork in the road given Jealous’ support for the reform, and Hogan’s relative silence (but openness to a referendum). For what it’s worth, Michigan voters approved legalization yesterday, while Missouri and Utah of all places, approved medical marijuana. 3) JUDICIAL APPOINTMENTS – There was some discussion during the election about the fact that due to Maryland’s mandatory retirement age for judges, 5 out of 7 members of our state’s highest court would be appointed by our next Governor (Hogan). Notably, during the last term there were serious pushes to increase the retirement age. Perhaps that issue returns once again. 4) TAX CUTS – Given that Hogan ran on cutting taxes (something he hasn’t really delivered on), I assume he’ll try again. We have a temporary budget surplus, but some Democrats will probably want to use it for something else like…. 5) SCHOOL FUNDING – The Kirwan Commission recommendations for school funding and innovation will soon be made into policy proposals (eg: Pre-K). These will cost money. What will Hogan do? 6) HIGHWAY WIDENING – This was Hogan’s idea, so if he had lost re-election, these highway widening proposals would’ve been dead. Now they’re not. There will be a fight. 7) MINIMUM WAGE – There’s going to be a “Fight for $15” push in Maryland, and Montgomery County now has a minimum wage indexed to inflation. This debate is unavoidable. How does all of this play out with a term-limited Republican Governor serving with an even deeper bench of Democratic lawmakers and County Executives? Hold on to your hats! The next four years are going to be very interesting. I’m trying to compile a list of new African-American, Latino, Asian American and Native American Members of Congress. Additionally, I am attempting to identify the ethnicity/country of origin for Latinos and Asian Americans. So I can’t add and have had to take down the previous post on the county legislative results. Here are the corrected numbers. Thanks to the readers who caught the error and also reminded me that Prince George’s has added two at-large seats to the county council in this election cycle. The Democratic pickup of six seats along with their gain of the two new at-large seats in Prince George’s brings their new total to 69, which leaves them 6 seats behind the Republicans once you include the seats not up for election this year in Baltimore City and Cecil County. The shifts give Democrats new majorities in the Anne Arundel and Dorchester County Councils. Results Tracker at https://tinyurl.com/ybtwqv4m has been updated for all the key races in the Senate, House of Delegates, and County Exec races. Check it out. Looks like I missed yet two more pickups by the Democrats in the House of Delegates that weren’t even on the map. In Baltimore County District 42A, Democrat Michelle Guyton looks set to take the second of two delegate seats. She leads Tim Robinson by 306 votes. Meanwhile, in single-member Frederick County District 3B, Democrat Ken Kerr leads incumbent Republican Del. Bill Folden by 552 votes. That brings the total number of Democratic pickups to 7 seats. In my earlier count, I missed a surprise Democratic Senate pickup. Democrats lost Districts 38 and 42 for the Senate. But they look to have pulled an upset in Howard/Carroll District 8 where Sen. Gail Bates narrowly trails Katie Fry Hester. Right now, Hester leads Bates by 154 votes, or 0.2%. In District 9, absentee ballots have thus far been received from 1082 Democrats, 693 Republicans, and 348 unaffiliated and minor party registrants. These numbers don’t bode well for Bates. While Democrats compose 39% of active registered voters, they comprise 51% of received absentees. Yet more evidence that Larry Hogan had no coattails. 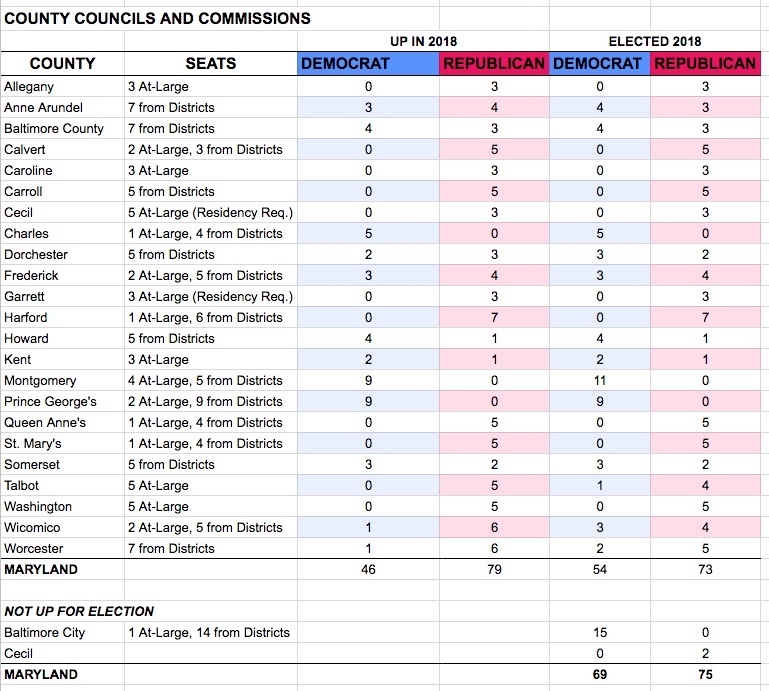 In 2014, Democrats won 46 seats and Republicans 79 among the 23 counties holding elections for their counties and commissions. After tonight’s election, Democrats gained 5 seats to bring their total to 51 seats and drop Republicans to 74 seats. In Anne Arundel and Dorchester, Democrats gained one seat apiece to take control of these county legislatures. Democrats also gained one seat apiece in Talbot, Wicomico, and Worcester. Democrats retained all the seats in Charles, Montgomery and Prince George’s. Republicans did the same in Allegany, Calvert, Caroline, Carroll, Cecil, Garrett, Harford, Queen Anne’s, St. Mary’s and Washington Counties. Right now, Democrats outnumber Republicans in the legislatures of 9 of Maryland’s 24 jurisdictions. These include most of the largest including Anne Arundel, Baltimore City, Baltimore County, Charles Howard, Montgomery, and Prince George’s. Democrats will be up four or five seats in the new House of Delegates. In deep red St. Mary’s County, Democrat Brian Crosby defeated Republican Del. Deb Rey by 52.6% to 47.2%. Democrats will be up five seats if their 25 vote lead holds up for the second seat in Harford District 34A.